I love a good cheeseburger! The messier the better! Pizza and cheeseburger are my two favorite foods and if you know me well, you know that I never pass up a chance to eat at our local Pizza King, and we can be found there most Sundays after church, or at the chance to eat at any "hole in the wall" restaurant because those are the ones that serve the best cheeseburgers! 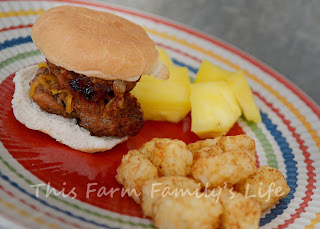 I also never pass up the opportunity to have those two foods at home, so when I saw this recipe for Smoky Barbecue Sliders I knew that I had to try it. As a bonus, they also include my second most favorite food...bacon. Oh.My.Goodness. So delicious! 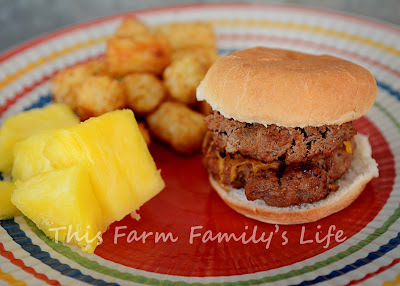 These were probably the best cheeseburgers I have ever grilled! I made these a couple weeks ago and Brad asked tonight when we were going to have them again. And the girls loved the mini sandwiches. This would make the perfect burger for Father's Day. Cook bacon until crisp. Drain on paper towels and let cool and crumble. Drain all but 1 Tablespoon bacon grease from skillet; saute onion for about 3 minutes. Add garlic powder and stir into bacon. Saute for an additional minute. Let cool. Mix ground beef, paprika, barbecue sauce, salt, pepper, and reserved bacon and onion. Grill over medium heat for 6-10 minutes per side. Top half of them with shredded cheese and allow to melt for a minute or so. Top with another patty and serve on buns.